These billet aluminum fuel fill doors work great in a pick-up bed or any flat surface. Can be flush mounted. Oval. The hole needed for mounting is approximately 1/8" smaller than the total length and width to allow a nice finished appearance when installed. Includes studs, nuts and nylon spacers. No gas cap, gas filler or instructions are included. Mounting hardware included: four studs, nuts and nylon washers. This oval access door can work well for fuel filling and other types of access, like a floor-mount master cylinder. 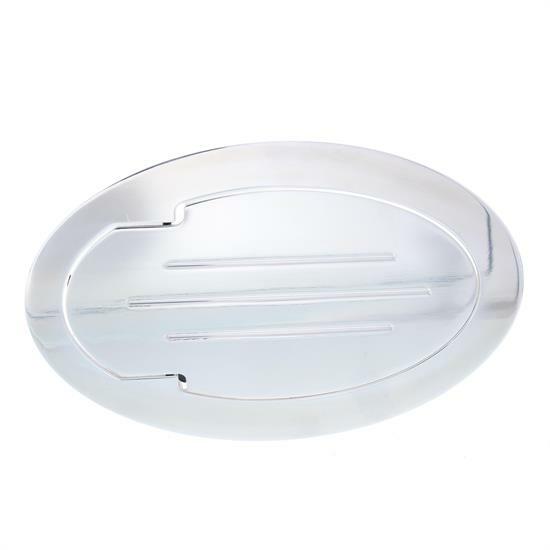 Speedway Billet Aluminum Oval Fuel Door, 6.88" x 4.50"
Gas Filler Door, 4.25" X 5.5"